Have you ever walked into a room perfectly at peace with the world only to find yourself inexplicably sliding into agitation or despair? 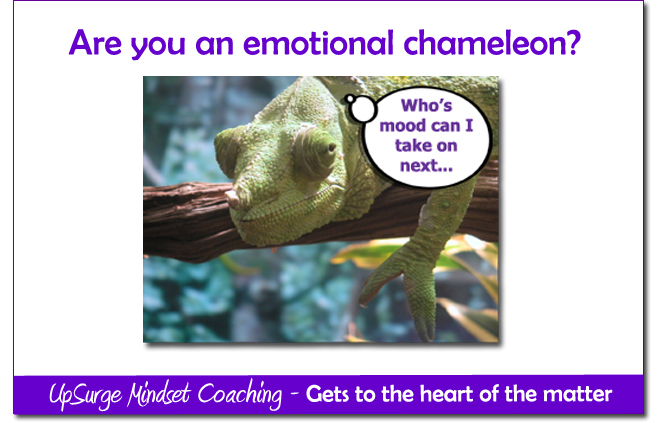 Are you an emotional chameleon that takes on the moods and emotions of people around you and then can’t shake them off again? I would hazard a guess that the vast majority of us have at some stage or do with frustrating frequency. Congratulations you’re empathic, and commiserations your emotional boundaries may need repair and maintenance – join the club! Our ability for empathy is vital for our social connections but sometimes we can get a bit hazy where our energy finishes and another person’s begins so we can become a human ‘emotional vacuum cleaner’ sucking up energetic states from all and sundry. Some people almost demand that you hoover up their state and can feel pretty miffed if don’t join a pity party that they are throwing for example. Pity parties never have any decent entertainment – the topics of conversations reek of ‘poor me’ and sometimes they descend into what I uncharitably call ‘pity Top Trumps’. Pity Top Trumps is where one person relates a tale of woe and then the next person tries to trump it with an even more heart wrenching account of something that happened to them and so it goes back and forth. Now, in case you are reading this thinking I am heartless to the suffering of others, I am most definitely not. I have also been known to have a bloody good rant myself now and again. I just invite you get really honest with yourself as to why you are sharing at that time. If you are genuinely touching back into the feelings from a trying experience then I applaud your bravery – sitting with uncomfortable emotions to see their wisdom take guts – all power to you. But, if you are wanting to impress someone with how resilient you are in the face of hardship then it might be time to hit the mute button. It can be really tricky to know whether emotions are yours or whether you should ‘return to sender’. Someone far wiser than me shared a simple emotional ownership test and by joves it’s a cracker. You simply ask yourself ‘is this mine?’ Your intuition will have a pretty good idea on who’s got dibs on it. If the answer is yes, then chances are the universe is drawing your attention to something that is out of balance. If the answer is no, then happy days, just keep on smiling. Sometimes it gets more complicated than just taking on the moods of those around us. Sometimes we become actors in a strange pantomime called ‘shadow projection’. Rather than a one-off emotional chameleon episode, these projections can turn into an extended season of re-runs where the actors assume the same roles over and over, especially in families. Here’s the plot line – someone is adept at hiding their feelings of anger, frustration, resentment etc; along comes an empathic person with wobbly emotional boundaries and BAM! in ‘puppet like’ fashion they act out their repressed anger, frustration, resentment etc for them. Wouldn’t it be handy if someone acted out all the emotions that we didn’t want to own – then they would look like a right stinker and we’d come out squeaky clean. Hate to break it to you but that’s what a hell of a lot of people do – they go around dropping energetic stink bombs (picture ‘silent by violent’ rather than ‘loud and proud’) that others walk right into and give an Oscar worthy performance bringing those suppressed feelings to life. Sadly in families it’s often kids who absorb this disowned energy and it can be very damaging to them. Have you ever wondered how a ‘black sheep’ of the family comes about…they can be the one acting out the angst for a whole family. Kids don’t have robust energetic boundaries and often feel they are the cause of all unhappiness in the home. They are less adept at manufacturing ‘social acceptable’ behaviour and often less emotionally shut down than adults, so they feel what we may have trained ourselves to ignore. Heavy stuff I know, so rule of thumb – if you feel, you own it and remember ‘what you disown, owns you’ so take it on the chin or it will bite you on the bum! Sometimes taking on the feelings of others makes you feel like you are really supporting them. People with pleaser and peacemaker personalities (illiteration to the max) do this in an attempt to make others feel better, after all we all like our feelings to matter. But in the process of mirroring another’s feelings we can become less able to support them when they need us. We can end up hijacking their experience by telling them how we think they feel eg. you must devastated… Boundary alert – we can try to imagine what it is like to be in their shoes but we are not – this is their life lesson not ours and it’s just not classy to live vicariously through another’s pain. If you have 3 minutes take a look at this animated video by Brene Brown – it is funky little explanation of empathy verses sympathy. We are all interconnected energetically but always remember you have freewill – don’t be an emotional chameleon or as Daniel Goleman wrote ‘inability to notice our true feelings leaves us at their mercy. People with greater certainty about their feelings are better pilots of their lives’.